Customers implement PRISM G2 Cost Management to secure on-time and within budget project deliverables. 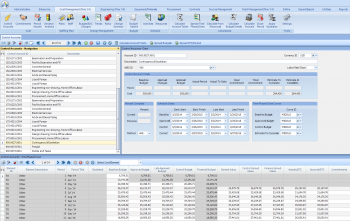 Integrate project schedules and cost estimates to develop time-phased budgets and forecasts, as well as measure performance and productivity using cost, hour, and quantity control elements. This module supports all required processes including: budgeting, resource planning, time-phasing, progress and performance measurement, earned value management, cost and schedule analysis, risk tracking, funds allocation, forecasting, and reporting. PRISM G2 Change supports an organization’s structured change management process. Its centralized design allows tracking of changes that affect budgets, forecasts, and commitments in the other PRISM G2 modules. PRISM G2 Engineering is an earned value engineering progress solution designed for budgeting and monitoring hours by tasks, deliverables, and packages. Engineering documents can be progressed using various methods including pre-defined milestones. Documents linked to engineering packages are subsequently linked to Control Accounts in PRISM G2 Cost to provide progress and performance at multiple levels of detail. PRISM G2 Contracts is a complete contracts administration tool for owners, EPCs and construction management firms. Create prime contracts, manage Request for Proposals (RFPs), conduct bid analyses, award committed contracts, as well as complete payment processing. PRISM G2 Procurement provides the required functionality to manage the complete procurement process for any size or type of project. Customers can easily generate purchase requisitions, Requests for Quotation (RFQs), bid analyses, and purchase orders by accessing process equipment and bill of material databases. Upon award, manage shipments to ensure items are properly tracked and delivered to the job site according to plan. PRISM G2 Field is an essential field progressing tool for efficient and timely status updates from the field. Keep the team, including contractors and subs, on track by identifying critical issues when tasks are going over budget or falling behind schedule. PRISM G2 Field is used to develop progress accounts and progress items that are budgeted and tracked in terms of quantities installed or completed as well as hours worked for field activities. With detailed field management throughout the project lifecycle, the project team will be alerted to issues in a timely manner allowing for the rapid development of corrective actions to keep projects on-time and within budget. PRISM Estimating (Powered by CostOS) is designed for organizations that require consistency and centralization of estimates and estimating data. With PRISM Estimating, users can create conceptual estimates for feasibility studies resulting in a range of detailed estimates that help to win work and develop sound budgets. PRISM Integrator is an out-of-the-box integration platform that connects IT systems, ERP systems, and financial systems enabling companies to orchestrate data flow that supports business goals. PRISM Docs is a documentation management solution for finding, sharing and controlling critical technical and business documents. It is a simple and flexible tool for solving the most complex data management, workflow and collaboration changes while easily addressing the unique requirements of other departments across the enterprise. 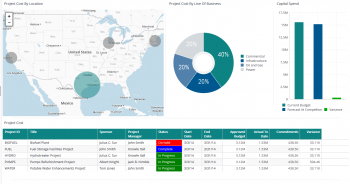 PRISM Dashboard enables executives and project controls professionals to visualize their data and understand project, program, and portfolio performance at a glance. It allows quick analysis of projects at the enterprise level while also being able to drill down into individual projects. By using PRISM Dashboard and PRISM’s embedded KPIs, exposure to project risks and costly surprises are markedly reduced, minimizing their impacts on project funding. Users of Dashboard can view performance budgets, earned values, actuals, commitments, forecasts, variances, and performance indices, while driving executive insight in real- time. Description: This white paper explores why it is important to investigate construction estimating software; what functionality should be sought after and, most importantly, how to achieve a successful implementation within the organization while delivering a good return on investment..
White Paper: Can ERP Software Effectively Satisfy Project Control's Requirements? Description: Learn about whether ERP software is truly an effective tool for managing all aspects of a project. It analyzes the advantages and disadvantages of using ERP software and offers alternatives for successful project management. Description: This case study shares how Praetorian Construction Management uses PRISM to help provide project management services to a wide variety of clients. PRISM gives Praetorian the flexibility they need while also increasing data accuracy, creating useful reports, and improving forecasting and trending. Description: This white paper explores why project management cannot be successful without strong project controls to keep the project on track. It identifies the components that make up agood project controls system (people, processes and software) and how this system ultimately helps an organization to achieve success. Description: Download this free PRISM case study today. Learn how Laing O'Rourke Australia implemented a project lifecycle management solution to provide change management control, create a robust labor productivity monitoring and control process, and establish an early warning mechanism to enable confident decision making. Description: Download this free case study today! Explore how LLW Repository Ltd used PRISM to improve reporting, reduce reliance on spreadsheets, and increase control over their processes. They are now able to produce reports quickly while having total confidence in their data.